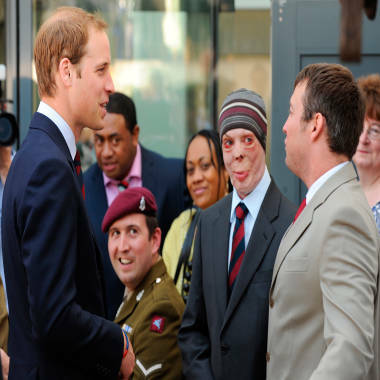 Prince William, left, speaks to patients, including Lance-Corporal Martyn Compton (second from right), during a tour of the Help for Heroes Rehabilitation Complex in Surrey, England, in June 2010. Compton, who served alongside the prince in the Household Cavalry, will attend the royal wedding. Mingling with the celebrities, royalty, politicians and sports stars who will attend the royal wedding Friday will be another special guest: an Afghan war veteran who was so severely burned in a 2006 ambush that he lost his ears and nose. Lance-Corporal Martyn Compton is a friend of Prince William, who served beside him in the Household Cavalry. Burned over 70 percent of his body in the ambush, he was in a coma for three months. But despite his severe injuries, by July 2008 he was able to attend another important wedding: his own, to Michelle Clifford, a secondary-school teacher he met in 2006. Compton had proposed to her just two weeks before his four-month stint in Helmand province, one of the most dangerous areas of Afghanistan. Five weeks into it, his convoy was ambushed by Taliban fighters and a rocket-powered grenade hit the vehicle Compton was driving. Engulfed in flames, he jumped from the vehicle, breaking one arm before managing to pull off his helmet and body armor with the other. After putting out the flames by rolling in sand, he tried to crawl to cover but was shot in the leg by a Taliban fighter before his comrades, risking their lives, pulled him to safety in a tank. Compton "died" three times en route back to the British base, but was revived each time. In May 2008, Prince William honored his friend at a special pageant in London. "Compo, you're more famous than me," the prince joked, according to the U.K. Daily Mail. "You're in the papers every day."